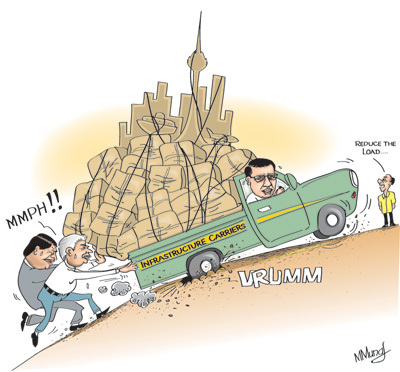 The improvement of the country’s economic infrastructure was an achievement of the Mahinda Rajapaksa government. However, there were large infrastructure investments whose costs were enormous and benefits doubtful. These include large sports stadiums, a second international airport and the expansion of the Hambantota harbour. The costs of infrastructure projects are also deemed excessive owing to lack of transparency in awarding contracts and corruption. The methods of financing them and disregard of their rates of return are serious weaknesses. After the end of the war, there was a new impetus for the development of infrastructure. Although the finances of the country were by no means healthy, the Government had a vision to improve the country’s neglected and devastated infrastructure. Expenditure on infrastructure development was increased to about 5 per cent of GDP. The development of the country’s energy capacity, new highways, roads, bridges, fisheries harbours and irrigation were significant achievements. The reconstruction of the devastated North and East was also significant. The Colombo Port was developed, the Hambantota port expanded and a second international airport constructed. Another feature was the beautification of Colombo and its suburbs, the development of recreational facilities and the impressive restoration of old neglected buildings such as the Colombo Race Course and the Dutch Hospital in the Fort. These have improved the beauty and quality of life in the city. However, the massive money spent on these urban facilities could have been spent on more pressing needs of the rural poor. Some infrastructure investments, such as roads, bridges, irrigation, fisheries and ports would give high rates of return and complement private investments. Others would not give adequate rates of return when properly estimated taking into account social benefits and costs. These would be a burden in the future, particularly those that do not generate returns to pay off the debt accrued. Also if the returns cannot be transformed into tradable goods or services they will create long term balance of payments problems. However important infrastructure development is for the country, expenditure on infrastructure investment should consider the costs and benefits of such investment and how they are financed. All infrastructure investments are not equally valuable to the country’s economic and social development. There should have been prioritisation of infrastructure investment. There are emerging concerns about the vast expenditure on infrastructure development. Even if we assume that these investments on infrastructure would benefit the economy, its huge initial expenditure and long periods of gestation raises critical economic concerns. The huge investments create strains in public finances resulting in large fiscal deficits that lead to large public debt. The large expenditure on infrastructure development in the last five years has been an important factor in increasing the public debt and the debt servicing cost. There is need for prioritisation of infrastructure investment to ensure that infrastructure projects lead to higher returns and increase export earnings or reduce import expenditure. Investment in energy would no doubt increase the production capacity of the country and help export industries. Some highways, roads and bridges would be economically more beneficial than others. Similarly, the development of ports and other transport infrastructure has a range of cost: benefit ratios. Therefore the prioritisation of infrastructure on the basis of costs and benefits and rates of return is important. Import costs, export earnings and the impact of financing on the public finances and debt servicing costs should be considerations in infrastructure investment. It is necessary to select infrastructure development on a priority basis. Those infrastructure developments, which bear fruit in a shorter period, should be mixed with important infrastructure development that brings returns over a long period of time. Infrastructure developments that are of doubtful returns or ones that bring returns over a long period should be avoided till such time as the country’s economy could afford them. Several of the large investments in infrastructure have been too costly and of doubtful economic benefit. In continuing its infrastructure development, the Government should consider the high expenditure that would lead to inflationary pressures when financed by borrowing from the domestic banking system. Furthermore, when there is large import content in infrastructure projects, they increase import expenditure and strain the balance of payments, as has happened recently. Foreign financing is a means of avoiding these pitfalls, but large foreign borrowing would result in high foreign debt servicing costs. For these reasons, infrastructure investment should be phased out. Infrastructure investments that were heavily financed by foreign borrowing should have had potential for increasing foreign exchange earnings or reducing import expenditure or else it would be a burden on the balance of payments. There will no doubt be some economic and social benefits from economic infrastructure that has been developed in the past five years. Nevertheless, huge expenditures on infrastructure tend to be a strain on the public finances and threaten economic stability. It is, therefore, vital that future programmes of infrastructure development must focus on investments with a shorter gestation period and a more direct impact on production, and either save import expenditure or enhance export earnings. The Government has to also deal with infrastructure projects that the previous administration has committed the country. These not only have economic and financial implications but also political and foreign policy implications. The Government must tread cautiously, wisely and diplomatically when taking decisions. Then there are the huge investments of doubtful use, such as the Mattala airport. Since a massive investment has been already made, the Government has to find ways and means to use these such that some returns are obtained from them. A new thrust in tourism from Hambantota to Yala, East coast, to the hill country and then to other areas is one that could be seriously considered. The possibility of cutting down the costs of these projects and continuing them is a wise course of action. The cost of the Northern Highway has been reduced by Rs. 60 billion, from its earlier cost of Rs. 245 billion. Such reductions in costs should decrease the costs on infrastructure expenditure. The development of infrastructure so essential for economic development must be undertaken in the most cost effective manner in consideration of its economic and social benefits and financial and economic implications of investment. Mangala’s deal with human rights chief — a sell-out?